Whether your objective is to boost brand identity, stand out from the crowd or simply to ensure your customers can find you, design is at the forefront of what we do. We can help shape your ideas or come up with designs from scratch that match your desired outcomes. 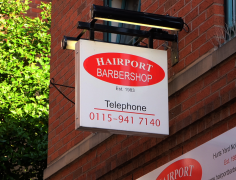 Our sign-makers use a wide range of high quality materials and the latest in sign making technologies. The experience of our manufacturing team ensures we have the flexibility and capacity to produce in high volumes and within short timescales, delivering exceptional results. 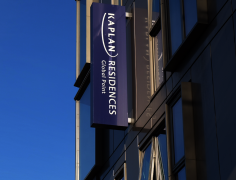 We install signage all over the UK and our equipment and expertise ensures each installation is carried out safely and accurately in a structured manner that delivers the best finish for our clients. Our friendly team are CSCS certified and operate under strict health & safety guidelines. Check our awesome team projects. 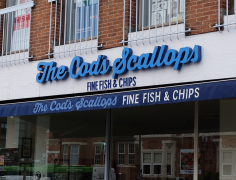 Alex and his team have help with the design, manufacture and installation of all signage at the popular Cod Scallop restaurants, carrying out the work on the Mansfield Road and Bramcote branches. 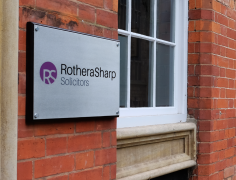 Clockwork Signs Ltd are a Nottingham based company, with over 20 years’ experience in providing signage solutions to businesses of all sizes across the country. Clockwork offer a full service from design and manufacture, through to fitting and maintenance. Our team provide a friendly and professional service that focuses on high quality products that will help promote your business whilst remaining competitive on price and bringing you cost-effective results. Alex carried out extensive work across all 8 of our sites; replacing, re-developing and implementing over 50 signs across all branches within a very short timescale. His team delivered fantastic results and exceptional value for money. Very professional, responsive, always delivering everything on time, to a fantastic spec and within budget. Highly recommended.